I have been using green cleaning products for years but there were certain products that I found lacking. The product that I had the most difficulty finding in an all natural line that was effective was fabric softener. My husband has recently been complaining so I went on a quest to find a natural fabric softener that really worked. That is how I discovered Sun and Earth Cleaners and I was amazed at the variety of available cleaning products and how amazingly it worked. 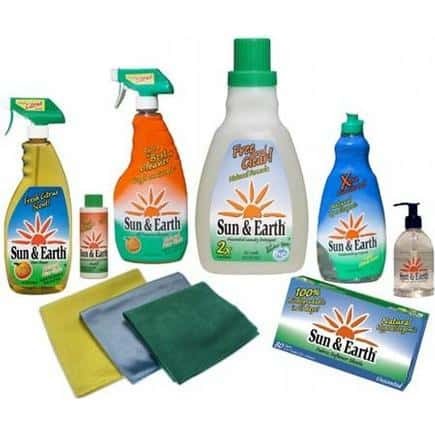 Sun and Earth Cleaners have a full line of natural cleaners and biodegradable detergents. As the mother of three young children, I appreciate that Sun and Earth Cleaners are non-toxic, organic, vegan, no tree nut and no peanuts. None of their products are ever tested on animals. Sun and Earth Cleaners stood out to immediately because the fresh citrus scent was fantastic but not overpowering. The fragrance comes from natural oils and that is important to me because of my daughter’s severe asthma, allergies and eczema prone skin. 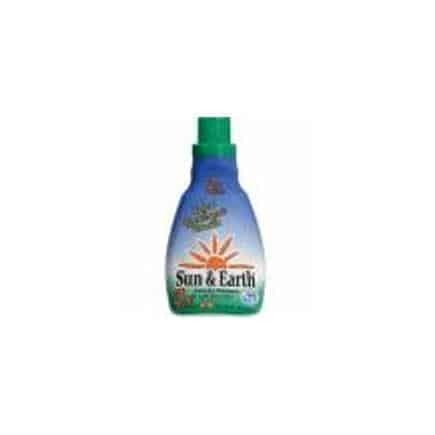 The first product that I tried was the Sun and Earth Deep Cleaning Detergent. I decided to go crazy and try it first on my husband’s filthy work clothes (he is a printing press operator). I was impressed that his clothes came out clean and smelling fresh. My husband commented very positively on the lingering smell that he liked because it didn’t smell “flowery.” It was as though an orange had burst open on his clothes. Next, I used it on a load of my children’s laundry. The big test was whether it not it would cause a reaction on my daughter’s sensitive skin and I am pleased to report that it did not. I also had the chance to try the Sun and Earth All Purpose Cleanser and the Sun and Earth Dishwashing Liquid. I tend to have allergic reactions on my hands when I use harsh cleansers or dishwashing liquids and the only comment that I can make about my hands after using these products numerous times is that my hands were soft and smooth. The Sun and Earth All Purpose Cleanser cleans really well and makes the house smell great. One product that I don’t think I will be able to clean without again is the Sun and Earth Concentrated Floor Cleaner which really made our tile shine and that is no easy feat with three kids and a large dog. I am pleased to offer you the opportunity to try Sun and Earth products in a “Centsible Life Value Pack.” This is such a fantastic value and won’t break your budget. It includes a 50 oz. 2x Free and Clear Laundry Detergent (1) 80 ct. Free and Clear Unscented Fabric Softener Dryer Sheets, (1) 22 oz. All Purpose Cleaner, (2) 4 oz. All Purpose Cleaner Concentrated REFILL, (1) 22 oz. Glass Cleaner, (1) 22 oz. Xtra Concentrated Dish Liquid, (1) 8 oz. Handsoap, (1) 3-pack of Microfiber Cloths and a FREE instant On The Spot Stain Remover. We’re excited to read that you enjoyed our products and found them helpful for your family.